Tate Modern presents a major exhibition of works by Cy Twombly, one of the most highly regarded painters working today and a foremost figure among the generation of American artists that includes Jasper Johns, Robert Rauschenberg and Andy Warhol. 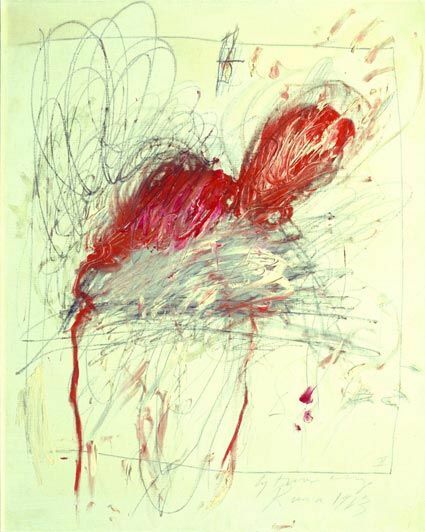 Twombly rose to prominence through a distinctive style characterised by scribbles and vibrantly daubed paint. This is his first solo retrospective in fifteen years, and provides an overview of his work from the 1950s to now. Twombly emerged as a painter at the height of Abstract Expressionism, then in 1957 he left America for Italy, where he drew inspiration from European literature and classical culture. At the heart of the exhibition is Twombly's work exploring the cycles associated with seasons, nature and the passing of time. Several key groups are brought together for the first time, such as Tate's Four Seasons 19934 with those from the Museum of Modern Art, New York. The exhibition also explores how Twombly is influenced by antiquity, myth and the Mediterranean, for example the violent red swirls in the Bacchus 2005 paintings which bring to mind the drunken god of wine. This exhibition provides a unique opportunity to see the full range of Twombly's long and influential career from a fresh perspective.